I barely slept last night. 0330 - 0615. And then Liam tried to get out of school by using his entire arsenal of excuses. Including the new phrase, "I'm going to burst." Much yelling, crying, and gnashing of teeth followed. But no bursting. I'm dead on my feet but I do have one dubious pleasure. 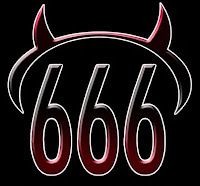 I'm officially entering Luciferian blog post #666. Odd how we mark the milestones in our lives. Next stop: #1000!